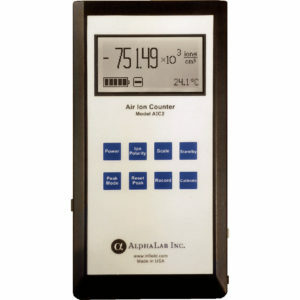 Air Ion Counter - AlphaLab, Inc. 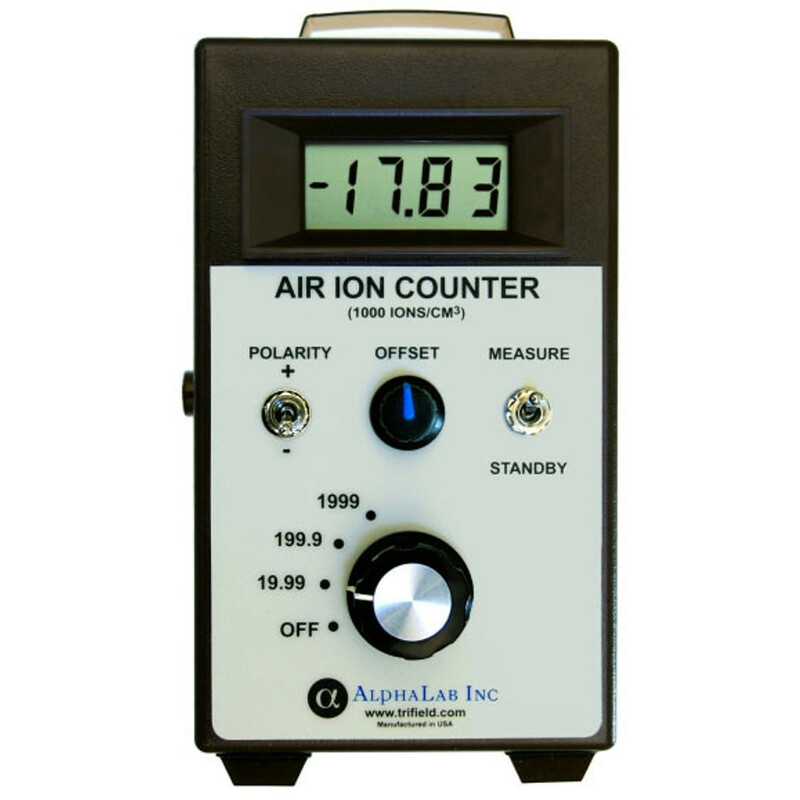 The Air Ion Counter is a handheld meter designed to measure ion density– the number of ions per cubic centimeter (ions/cc) in air. It measures this number separately for positive and negative ions (+ and – ions are usually present simultaneously). This instrument is a true ion density meter, based on a Gerdien Tube (Gerdien Condenser) design, and it contains a fan which pulls air through the meter at a calibrated rate. The standard model measures up to 2 million ions/cc (for comparison, outdoor air typically has 100 to 1000 ions/cc, both + and -). The 2 million range is sufficient for almost all situations except for measuring very close to electric ionizers or strong radioactive sources. For these applications, models with ranges of 20 million and 200 million ions/cc are also available. (Range can be specified on the checkout page; all three ranges are $528.) AC Adapter included. A plug can be inserted in the left side of the meter to monitor the output, which is a slowly-changing analog voltage. This is a stereo phone plug identical to the plug on small headphones in which the ground has been cut. An output of +1.999 volts (or -1.999) represents full-scale of the meter, regardless of which RANGE is selected. AlphaLab also sells the USB-DL1 Datalogger which is great for streaming data from the AIC to a Windows PC. Air is sucked in at the top (photo), is measured, and exits at the bottom. The display shows the ion count within 2 seconds and it continues to display the ion density in the air, showing any changes within 2 seconds after they occur. The POLARITY switch determines whether + or – ion density is displayed. (In the photo, negative ion density is being measured.) To conserve power, the switch on the right side can be flipped to STANDBY; this turns the fan off and stops the measurement. A rotary offset control fine-tunes the internal amplifier so the display reads zero if no ions are present (or whenever the meter is on STANDBY). No adjustment of this is needed unless the temperature changes significantly. An analog output jack is present, which is useful for long-term automated monitoring. The meter uses a standard 9 volt battery, but an AC adapter and a rechargeable battery system are two options. Please note: solids do not produce ions unless there is an energy source (such as radioactivity, high voltage or heat above about 600° C). For example, neither tourmaline nor “diodes” produce any ions at room temperature unless radioactive material has been added. However, liquids evaporating can produce ions. Range/Resolution1: 2 million / 10 (ions per cc) Range change is manual. 1. When ordering the 20 million ions/cc model, multiply range and resolution by 10. For the 200 million model, multiply by 100. 2. The unpredictable nature of ion self-destruction in the air just outside the meter makes more accurate measurement impossible (some ions are lost as air is redirected, positive and negative ions neutralize each other spontaneously, etc.) Air flow through the unit in still air is normally 400 cm3 / sec. External wind, with wind guard in place, up to 15 km/hr (9 mph) in any direction will maintain accuracy to within +/- 25%. Air flow of 250-1000 cm3 / sec is acceptable. Settling time is 1 second for a change, but allow 5 seconds after POLARITY switch setting is changed. Noise level for AIC 2 million version is 10 ions/cm3 (2 second sampling time). Noise is negligible for 20 million and 200 million versions.